Biography of Italian anarchist Giovanina Caleffi aka Giovanna Berneri, who, as well as being involved in anti-fascist resistance during the Second World War and helping rebuild the Italian anarchist movement after it, was also the wife of Camillo Berneri and mother of Marie Louise and Giliana Berneri. Giovannina Caleffi was born at Gualtieri near Reggio Emilia on 4 May 1897 to Giuseppe and Caterina Simonazzi, a poor farming family with four other children. Her father emigrated to Pittsburgh in the USA with the oldest son. Giovannina (usually called Giovanna) went to school at Gualtieri and from 1914, to Reggio Emilia where she completed her studies, thanks to the sacrifices of her older brothers. She started going to socialist meetings. At the age of fifteen, she lost her faith in Catholicism after discussions within her family. She had Adalgisa Fochi as a teacher, a well known writer and noted socialist active in women’s circles. Giovanna got her diploma in 1915 and began to teach in elementary school at Santa Vittoria di Gualtieri and the following year at Montecchio Emilia. In this period she got to know Camillo Berneri, son of her teacher Fochi, a high school student in the FGS (The Socialist Youth Federation, which from 1916 started moving in an anarchist direction). Camillo transferred to Arezzo, where his mother was teaching, and Giovanna joined him there after a year. They were married on 4th November 1917 at Gualtieri. On 1st March 1918, whilst Camillo was in prison for refusing to serve in the army, their first daughter Maria Luisa was born. The family subsequently moved to Florence. Their second daughter Giliana was born there on 15th October 1919. Their house became an important meeting place for anarchists and antifascists. Camillo was physically attacked twice. The family was forced to move into exile in France, Camillo leaving first, followed after a short interval by Giovanna and their daughters, managing to secretly get over the border into France in August 1926. The family lived on the outskirts of Paris in great poverty. Eventually Camillo, after being hounded by the French authorities at the instigation of the Italian regime, parted for Spain and Giovanna was left to look after the children on her own. Camillo Berneri was murdered by the Stalinists on 5th May 1937. Giovanna attended the funeral with her daughter Maria Luisa. She gave aid to the Italian comrades expelled from Spain and then interned in French concentration camps. She was an animator of the C. Berneri Committee in Paris and from 1938 published a collection of Camillo’s writings under the title Pensieri e Battaglie Thought and Struggle), with a preface by Emma Goldman. In this period she contributed to the underground Italian anarchist press. With the German occupation of France, she was arrested on 28th October 1940 and spent 3 months in the prison of La Santé in Paris. In February 1941 she was deported to Germany and stayed in prison there for 5 months. She was transferred from prison to prison, ending up in Austria where she was handed back to the Italian authorities. She was sentenced on 25th August to a year’s imprisonment at Lacedonia in the province of Avellino, for subversive activities against the Italian state. After the completion of her sentence she went into hiding and took part in resistance activities. She began a relationship with Cesare Zaccaria, an old friend of the family, and moved in with him from February 1943. At the end of the war the new couple worked for the rebirth of the anarchist movement along with Armido Abbate, Pio Turroni and others. They published the underground anarchist paper La Rivoluzione libertaria in 1944 and then the paper Volontà, which, following the anarchist conference in Carrara in 1945, became a magazine to which the writers Ignazio Silone, Albert Camus, Gaetano Salvemini etc contributed and which Giovanna played a key role in. In the immediate post-war period she was heavily involved in anarchist propaganda and activity. 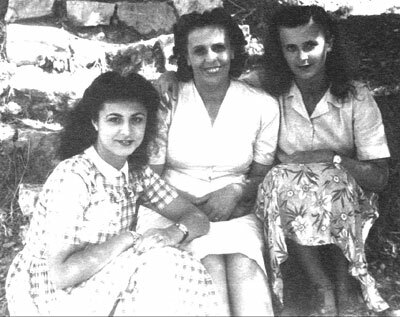 With Zaccaria she wrote the pamphlet Societa senza stato (The Stateless Society) in 1947. She believed in the dire need to relate anarchism to the masses. She was involved in intensive editorial and publishing activity, bringing out writings by Malatesta, Volin, Fabbri, Carlo Doglio and others. She was a leading light in the campaign in favour of birth control, and with Cesare Zaccaria wrote a pamphlet Il controllo delle nascite (Birth Control) in 1948, which collated a series of articles that had appeared from 1947 in Volontà. It was immediately seized by the authorities. She and Zaccaria were put on trial for “propaganda against procreation” ending with their acquittal in May 1950. She contributed articles to various anarchist papers including Umanità nova, L’Adunata dei refrattari, Controcorrente of Boston, Il Mondo, Il Lavoro Nuovo of Genoa, etc. She was active within the correspondence committees of the Italian Anarchist Federation for several stretches. In the summer of 1948 she started the project of a summer holiday for children which she continued the following year. In April of the same year, 1949, she suffered the second great tragedy of her life, the death of Maria Luisa at 31. Giovanna decided to honour the memory of her daughter by setting up a libertarian colony for children, the Colonia Maria Luisa Berneri, open to the children of anarchists of all countries. This was first attempted at Cesenatico, but with poor results because of limited funds. The 1st July 1951, the colony became a reality, although on a modest level, thanks to Zaccaria, who put his country house at Piano di Sorrento at its disposal. It sheltered three groups of thirty children. This positive experience lasted 7 years, ending in the summer of 1957, with a large deficit and without the availability of the house at Piano di Sorrento because of the end of the relationship between Giovanna and Zaccaria, and his break with the anarchist movement. She did not give up the project and with other anarchists from various countries managed to acquire a house and land at Ronchi near Marina di Massa. Giovanna moved to Genova Nervi in 1956, where the administration of Volonta transferred in January 1959. She died of a heart attack on 14th March 1962 in the hospital of Genova Nervi where she was recovering from a serious illness. The anarchist Aurelio Chessa nursed her in her last hours.